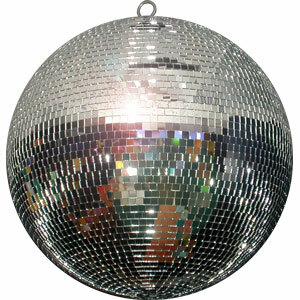 What`s better than this disco mirror ball to decorate your room and put a great 70 - 80 s atmosphere to your special event. This will be highly appreciated at children s parties, at a student dance , in bars and especially at Disco parties. Just hang with a wire to your ceiling or if you want your disco mirror ball to spin you can purchase the disco motor that is sold seperately - item # 1-18012. By using a projector light, the disco mirrors will reflective on the dance floor and give you the desired disco effect you are looking for. It measures 8 inches in diameter. The disco mirror ball is not recommended for children under the age of 5 years old.